Today i tell you 4 way for Menopause treatment,so what is menopause ? Menopause is considered to start one year following your woman's last period menopause involves many natural changes to a woman's entire reproductive system and various reproductive and non reproductive hormones. Women can experience a variety of symptoms and conditions related to change in the hormone levels and aging. 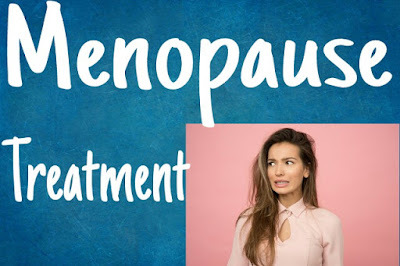 some of the most common symptoms of menopause include irregular periods as premenopause begins that is the period before menopause technically starts the periods can come and go plus it might get heavier or lighter at times. this can sometimes continue for several years during menopause hot flashes and night sweats, mood swings,irritability,anxiety or depressive symptoms, increased abdominal fat and great gain,insomnia and changes in the sleep quality,thinning of hair and drying of skin frequent urination and urinary tract infections, for some a high risk of certain other age-related disease include cardiovascular disease that is a heart disease dementia and osteoporosis. Here are four natural ways to reduce the menopausal symptoms. The most effective medicine is the food that you eat,you should try to eat a balance of good fats complex carbs and protein, also make sure to have plenty of fruits and vegetables at every meal including breakfast. it's best to eat three meals a day or two or more snacks in order to keep your blood sugar stable the most important thing to remember is to reduce carbohydrates especially refined carbs and sugars. Consume less calories overall in order to maintain your weight limit the empty calories by reducing your intake of packaged or processed foods, added sugar, refined carbs ,sugary drinks, alcohol and refined oils. fill up on with high-fiber foods to control your appetite, boost digestive health and benefit your heart, drink plenty of pure fresh water. Many women have a deep sense and feeling of being stressed anxious are all well and depressed during this transition in most cases antidepressants are not the best choice,stress can be the culprit behind the additional imbalances in hormones and neurotransmitters should affect mood as well as mental function thyroid function digestive function and especially blood sugar imbalances. stress has also been linked to symptoms like hot flashes and low libido one of the best way to release stress is deep breathing take a deep breath several times a day and practice this so, that it will reduce your stress and in turn it will help you with the menopausal symptoms. Most women gain way steadily during premenopause and menopause,especially around their bellies and abdominal this is common because fluctuating estrogen levels tends to cause your body to hold on the fat and facts actually produces estrogen which can even create more fat therefore this cycle continues. Exercise works wonders for menopausal women exercising not only boosts your serotonin levels that improves your mood but your appetite and helping you sleep better and helps you to balance hormones naturally and this also helps in maintaining your muscle mass which is important for preventing weight gain it also strengthens your bones to combat osteoporosis this is the common condition comes along with menopause you can do walking,swimming,biking.whatever form of exercise that you enjoy moving your body has a major impact on your weight and other menopausal symptoms and your overall health. Gentle exercise can be helpful especially for your adrenal glands if they're over when you constantly feel fatigued. Most importantly do something you enjoy. That will make hormones many herbs and foods then natural hormones and hormone balancing properties that can help you in this transition period, Many plants and herbs can adapt to the needs of your body it is possible for them because they have the same molecular features with our own hormones allowing them to support our hormone production make it slower or in even mimic what our own hormones do depending upon the body's unique needs, some herbs that can help reduce menopause symptoms include passions lover, ginseng ,black cohosh and ashwagandha.